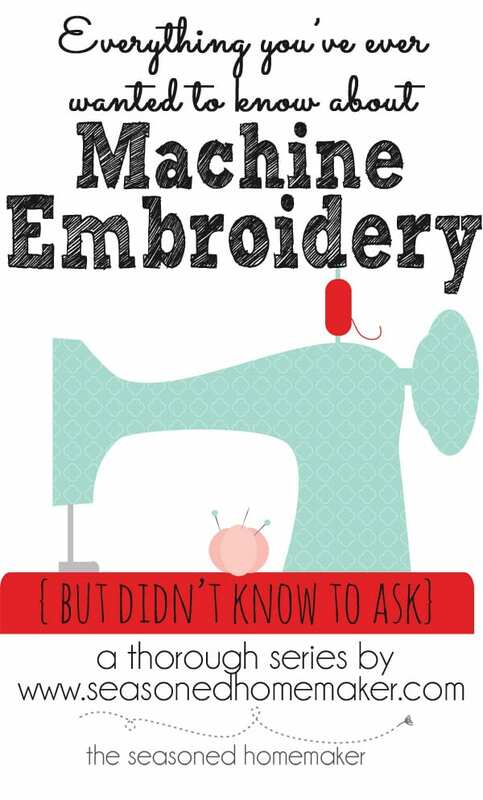 Are you curious about machine embroidery but don’t have a clue what type of questions to ask? Throughout the next thirty-one days I will be discussing various aspects of machine embroidery and covering every detail. You’ll learn about formatting, stabilizers, digitizing software, and a whole lot more. My ultimate goal is to help you make an informed decision before you purchase a machine. Thinking about purchasing an Embroidery Machine? Check out my Embroidery Machine Reviews. I tried to access this page of 31 days but found they were no longer there? Could you make bring them back for those of us just finding out about it on Pinterest? I’m pinning this as a resource. I have an embroidery machine but I rarely use it … I think I’m a bit overwhelmed and intimidated by that part of it! Thanks for pinning. Don’t be intimidated by that machine ~ it’s all a matter of the right stabilizer and the right thread. I’ve always found this fascinating for some reason. I used to contract with companies to make products for us, but wanted to know more about how it was actually done. Looking forward to reading these. Thanks ~ I belong to a machine embroidery club and we have lots of guys in the group ~ one actually teaches machine embroidery to visually impaired kids. How cool is that! Wow! I wish I would have had all of this great info prior to buying my machine! It took months to learn a fraction of the info listed; as you mentioned, not a lot of info out there. I’m forwarding this link to a friend that has been thinking of getting a machine. Perhaps this will assist with questions/comcerns as well as convince her how awesome they are to work with. Thank you so much! I’m so sorry you didn’t have this information. I hope this information will help you and others in the future. What I would like help on is knowing the correct steps on the finishing steps AFTER the embroidery is done. Especially on towels. How much of the tear away you are supposed to tear away. I want to learn how to do it correctly. Is there any on this? Tear away and pick away most of the stabilizer. Once washed, the rest will dissolve. I just saw this pinned and I was so excited to see that you did these tutorials. I have a Babylock Spirit and while I’ve had it 6 months, I still consider myself a beginner and need lots of help! Hi! Wanted to say thanks for this awesome plethora of information. I’ve been looking into getting my own embroidery machine, and there’s really not a lot of information out there to help guide you to the right decision. I do have one question though, about software. I had just assumed that when buying any machine, it would come with the proper software to get the deed done. I’m mostly looking into an embroidery machine for monogramming and appliqué. Do I really $2500 or even $1000 software? Thanks! I think Embrilliance has a nice starter program for around $150. That’s where I’d start. Leslie, fantastic series of articles. I have a Husqvarna Platinum 950E and its one amazing sewing machine. Bought 10 years ago it sews and embroiders perfectly with the most massive hoops. My problem – my machine uses cards and an obsolete card reader. Everyone heed Leslie when she says “don’t buy a machine that needs cards”. Husqvarna will not send me the driver for their no longer supported card reader. So I have a perfectly fantastic machine that I can’t use for embroidery because of their card system. It has cost me another $500 for a netbook with Windows 7 (that I had to reconfigure to Windows XP then take offline as the updates screw up the card reader). So buy a USB only machine. I’m taking a chance on the Singer Futura Quintet as the controls, although in a different place, look very much like my Viking 950E. Since Viking bought Singer I wouldn’t be surprised. Even the software names are very similar to all my existing Viking Software so hopefully the learning curve will be minimal. The Futura Quintet is at Costco in Canada for $550 on sale, hoops, software and shipping included and as I have three months to return I can’t go wrong. $2,400 plus another $5K plus for a new Viking has not even crossed my mind. Its just obscene given how technology in all other areas gets cheaper but the sewing companies refuse to budge. I am getting a 3D printer for $500 but I still need to shell out over $7,500 for an embroidery machine. There is something very wrong with this model. Thank you for sharing this. I agree about the technology issues regarding sewing software. They should make it with the ability to update with technology changes. 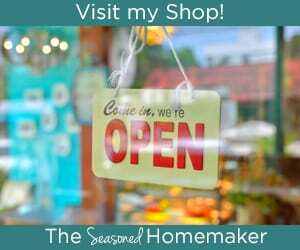 Thank you so much for sharing this information and for linking up to the Frugal Crafty Home Blog Hop! Pinning and saving for later. My question is:what is the difference between a quilting machine and an embroidery machine? This is a big question that requires a big answer. Basically, a quilting machine would a machine that exclusively quilts. It may have handles or it may be the kind where you sit to do your quilting. It only does quilting. An embroidery machine is different. It does machine embroidery with perfect satin stitching. An embroidery machine needs an embroidery design in order to do the embroidery. That usually requires some sort of software. There are sewing machines that are equipped for both machine quilting and machine embroidery. They are usually expensive, but these features allow you to have everything in one machine. Thank you for putting this together!! I have wanted an embroidery machine for forever and always felt very overwhelmed with what I would need to get started and how everything worked. I read through all your posts and just bought my first machine and a bunch of other stuff to get started. Thank you! Thank you for the tips on buying an embroidery machine, unfortunately I did not read this before I bought a Bernina. My problem is the Bernette 340. Deco that I purchased has become very frustrating. First of all, I am a Mac user, so had to borrow an extra PC to install the Bernina software. All I am really interested in emroidering is monograms. Now I understand I now have to purchase editing software. I have not had much support from the place I bought the machine – what do you suggest I purchase. I maybe should have spent a little more money and purchased a more advanced model for monogramming. What do you suggest? I always suggest that you find a dealer you trust. You may have to visit another town, but they are out there and will help you with your machine. Nevermind Leslie! I found a way to highlight Day 10 and click onto that page. Sometimes I’m technically challenged! Happy Holidays! I really have enjoyed reading your entire series on Embroidery. Wow your 31 day series was awesome! I am new to embroidery and this was extremely helpful! I do have one question. I have a design I would like to have embroidered on to shirts, it is my husband’s company logo. Is there some place I can send it into and have them digitize it and then send it back to me? I do not have software capable of doing digitizing. Thanks for sharing the blog! Great question. I suggest that you contact a few different digitizers on Etsy and see if they can help you. There are a ton of people who love to do this. I can’t believe how much useful information I have gotten from this site. I’ve been seeing for over forty years but I’m new to machine embroidery. From your first page I learned things I was doing wrong in trying to embroider a shirt for my grandson’s birthday. With your information, next year he will have the finest birthday shirt ever. I will certainly be reading about your other sewing subjects. Awesome site, thank you Leslie. Thank you for this insightful overview of Machine Embroidery. Your articles were so enjoyable to read – yet did not cause me to have “information overload”. I recently purchased the Brother Innov-is 990D Sewing and Embroidery machine. I am enjoying it immensely though I’ve only done a few practice embroideries and a few sewing projects so far. It is a wonderful machine. My “first” and only other machine is a 32 year old Singer that does straight and zig-zag stitches. Very good machine – but….. Anyway it was time to upgrade. Thank you again for all the information you shared. As others have said the information you provided regarding embroidery machines is awesome! I have a fantastic Juki F600 quilting/sewing machine and am looking to purchase an embroidery only machine. I would like to stay under $2,000, any suggestions on the ones I should consider? I would love to incorporate embroidery the in blocks and borders. Thanks! It’s hard for me to recommend anything beyond a Babylock or Bernina because I’ve owned both. I know that Babylock makes an embroidery only machine that’s under $2,000. I suggest you visit local dealers and find a dealer you can trust. Then look at the machines they carry. I imagine there will be one that perfectly fits your needs. Wow! What a list! I have an embroidery machine that I received as a gift last year, but haven’t had a chance to use it much. Can’t wait to learn more about it! After coveting embroidery machines for decades I finally convinced my husband to give me a Brother se1800 for Christmas this year. I am waiting for the weather to turn (live high in mountains of Colorado) to really get started and of course the weather has been nice! I really appreciate the information which you have provided in such a concise easy to understand manner. I will be popping back to see what other advise you have to offer. Thanks!